South Dakota has introduced new provisions for grain buyers. A recently passed bill by the state government has changed the maximum dollar amount of grain purchase for Class B grain buyers. The bill has also made changes to the amount of the South Dakota grain buyers bond for these license holders. 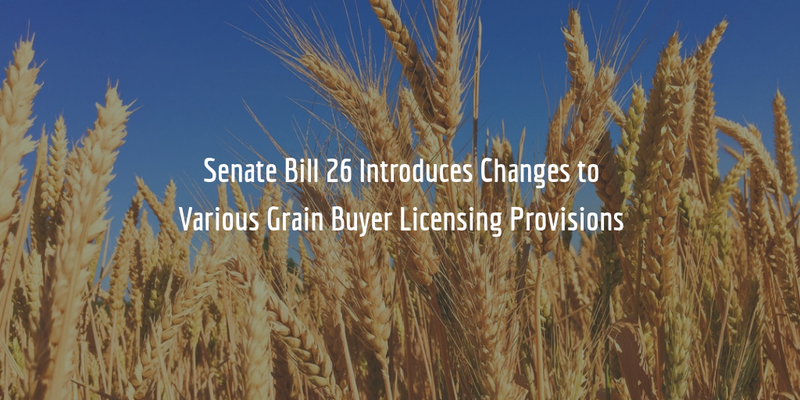 Read more about these and other changes to the provisions for grain buyers in South Dakota. Under the new provisions, Class B grain buyers will only be allowed to purchase up to $5 million in grain during their annual licensed period or enter into the same amount of voluntary credit sale contracts. Previously, this limit was $10 million but has now been reduced. Regarding the grain buyers bond amount, there is a new requirement about how the amount of the bond will be determined for buyers with less than three years of experience. The bond amount for both Class A and B grain buyers with less than three years of experience will be determined on the basis of their average purchases of grain in the preceding years or their projected purchases – whichever amount is greater. Previously projected purchases were not taken into account when determining the bond amount for such buyers. A $100,000 bond for purchases of grain between $2 million and $5 million per year. Finally, Class A buyers will now also be required to submit a balance sheet within 30 days of the end of each quarter. The reports shall be based on the buyer’s fiscal year, and not submitting a report will be considered a Class 1 misdemeanor. With the reduction in maximum bond amounts for Class B grain buyers, surety bond cost for such buyers will also decrease. A bond’s cost is a fraction of the full amount of the bond. The exact rate at which applicants can get bonded is determined by the surety on the basis of their credit score. Sometimes sureties may also take into account other financial information about the applicant, though credit score remains the most important factor. Applicants with a credit score of 700 FICO or more can expect to be offered a bond rate that could be as low as .75% and up to 1.5% of their bond amount. Applicants with slightly lower scores will likely be offered somewhat higher rates on their bond. The exact bonding rate is determined on a case-by-case basis. If you would like to receive a free and exact quote on your bond, complete our bond application form and we will shortly contact you with your quote. Apply for a free no-obligations quote on your surety bond! If you have any questions regarding the bonding requirements for grain buyers in South Dakota, don’t hesitate to call us at (877) 514-5146! What are utility bonds and when do you need them?